Hello TechnoGiants readers. TechnoGiants is again organizing a giveaway in-front of you guys and this time TechnoGiants is coming upto organize a NEW UNLIMITED giveaway for grabbing a Genuine License Code of CollageIt 3 for Mac and Windows OS worth $29.90. There are thousand kinds of software of collage creator for Mac. In fact, I have been trying much software for creating photo collage on Mac several times. However, I haven’t found an ideal one until CollageIt comes into my eyes. It’s the most easy-to-use, time-saving and multi-functional photo collage creator for Mac. It is better to allow you to create your unique and stunning collages in minutes since you are very busy with your work or housework. It is also better to easily use both for your seventy years old mother and your three years old son. And it is better to bring fun and happiness for them to use it. “Random Layout” can continuously generate all kinds of collage layouts in seconds by just a click. 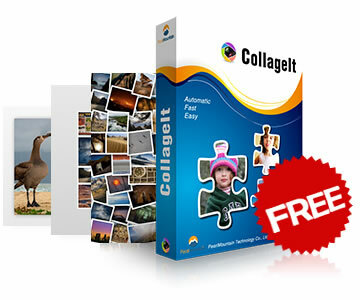 A Big Thanks to Sophia from PearlMountain for providing this opportunity to present the unlimited license code Giveaway of CollageIt for Mac and Windows OS. Don’t forget to act fast as much as you can because this offer will be wrap up after 3 days from today. Omitting the process of seeking for the license key like the other giveaway, all you have to do is just visiting the Exclusive Landing Page [Update: Giveaway ends]which is exclusively for TechnoGiants readers and click on ‘Download’ button to get software. During the period of three days (July 30th, 2014 – August 01th, 2014) validity. If you are like me whom want to make a custom photo collage in home, just take advantage of this giveaway to get a freebie code! Thanks, can we activate it anytime and what about updates? Yes, you can activate it anytime and you can have minor updates for free but it’s not available for a major update.